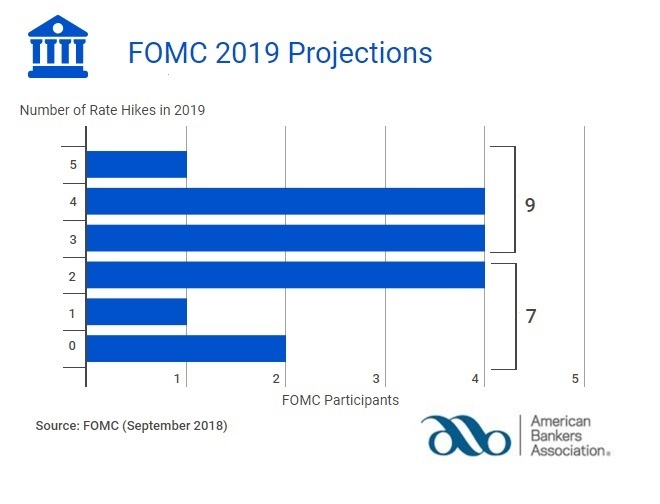 At its meeting today, the Federal Open Market Committee (FOMC) unanimously voted to raise the target range for the federal funds rate to 2.0 to 2.25 percent. It was the third hike this year. The committee signaled one more increase this year as economic activity has been rising at a strong rate. The Committee’s revised economic projections raised the forecast for 2018 GDP growth from 2.8 to 3.1 percent. Additionally, they nudged up the projected year-end unemployment rate from 3.6 to 3.7 percent. The balance sheet normalization program continues to be carried out as planned. Come October, $30 billion of Treasury securities and $20 billion of agency mortgage-backed securities will be rolled off the balance sheet per month.